Russell will be interred at Arlington National Cemetery on Wednesday, November 2nd, 2011 at 1pm. Russell C. Coile, 94, of Pacific Grove, died peacefully at home on Saturday, June 4, 2011. Coile was born in Washington, DC, and graduated from McKinley High School in Hawaii. He earned a Bachelor’s degree and two graduate degrees in Electrical Engineering from MIT, in Cambridge, MA, and a Ph.D. in Information Science from The City University, London, England. Upon graduation from MIT, he served as a geophysical observer for the Carnegie Institution of Washington, DC, at their observatory in Huancayo, Peru. After Pearl Harbor, he immediately returned to the U.S. for active duty in the military. 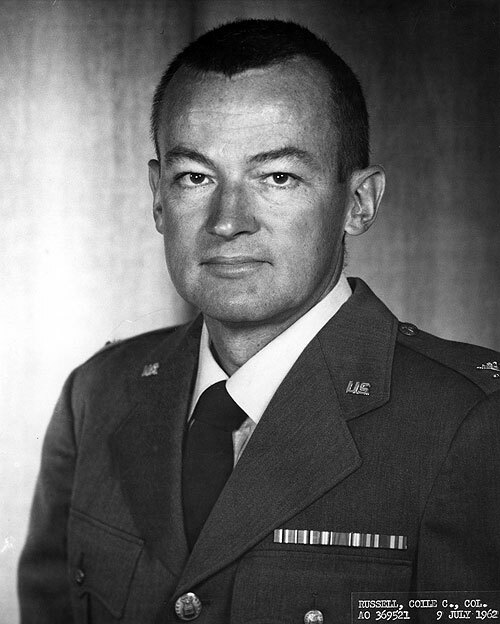 Coile served in the U.S. Army Signal Corps during World War II, and was the project officer for IFF, the transponder still in use on all aircraft today. When the U.S. Air Force was created in 1947, he was transferred from the Army to the Air Force to continue his projects, and retired from the USAF Reserve with the rank of Colonel. After WWII, he worked as a Professional Engineer in radio and the fledgling television broadcasting industry, designing transmission antennas. He then joined the staff of the Center for Naval Analyses as a research scientist, where he worked for 32 years conducting military Operations Research. His field research included radar detection while serving as air-crew during a dive bombing attack on the bridges over the Yalu River during the Korean War, and serving as Director, Marine Corps Operations Analysis Group during the Vietnam War. He also worked overseas with the Brazilian Navy, NATO forces, and the US military in Italy, England, and Japan. In 1982 he moved to the Monterey Peninsula to serve as Chief Scientist at the Combat Development Experimentation Command (CDEC) at Ford Ord and Fort Hunter Liggett. Coile then became a Certified Emergency Manager (one of the first 163 in the US), and served 10 years as Disaster Planning Coordinator for the City of Pacific Grove, followed by five years with the Sand City Police Department in the same capacity. During the 1990s he was sent to China by the National Science Foundation to teach disaster preparedness and prior to 9/11 was an Adjunct Professor at the Naval Postgraduate School conducting research on disaster response following a terrorist attack. He won countless awards throughout a long and distinguished career in many different, unrelated fields. His accomplishments are listed in Who’s Who in the World, Who’s Who in the United States, and Who’s Who in Science and Technology. He published 142 professional papers, as well as his memoir, DisasterMan: A Biographical Memoir. A private pilot for many years, he still holds the Aviation World Speed Record for the fastest flight from Washington, DC to Rome, NY. In addition to gliding, his lifelong passion was sailing. Throughout his life, Coile also was dedicated to volunteer service as Board member/President in a variety of causes, including the Pacific Grove Library, D.C. High School Math Club, International Student House of Washington, D.C., British National Association for Gifted Children, Atalanta Owners Society/North America, amateur radio clubs and Quaker service organizations. He recently received an Achievement Award from MIT. Coile was a loyal encouraging friend and mentored many young people with life-changing results, particularly minorities and professional women in the 1960s. He supported his wife Ellen’s many civic projects. Coile is survived by his wife of almost 60 years, Ellen Miller Coile; son Christopher Coile and his wife Susan Coile of Wareham, Massachusetts; daughter-in-law Lori Coile of Alameda, California; daughter Jennifer Coile and son-in-law John Robrock of Hollister, California; son Jonathan Coile and wife Wendy Coile of Grasonville, Maryland; son Andrew Coile of Marina, California; granddaughter Courtney Coile and her husband Henry Roman of Sudbury, Massachusetts, grandson Zachary Coile and his wife Diane Sullivan of Washington, DC, granddaughter Sienna Coile Robrock of San Francisco, California, and four great-grandchildren. He was predeceased by his parents Cecil and Gunda Coile, and his sons Russell Coile, Jr. and Benjamin Coile, as well as his sister Thelma McLachlan. There will be a Quaker Memorial Service at The Paul Mortuary, 390 Lighthouse Avenue, Pacific Grove, CA on Saturday, June 18th, at 2pm. Internment at Arlington National Cemetery will happen later this summer. In lieu of flowers, contributions can be made to the Friends of the Pacific Grove Public Library, 550 Central Avenue, Pacific Grove, CA 93950. Please share your thoughts, experiences and sentiments about Russell so everyone else can share them too.